Today marked another milestone for the Iranian-American tech community in Silicon Valley. Uber’s board of directors appointed Tehran-Born Dara Khosrowshahi as its new CEO after the controversies around its founder, Travis Kalanick. As Pejman Nozad eloquently puts, “The Persian Mafia in Tech gets $70B bigger!”. Dara Khosrowshahi is not the only Iranian-American executive in tech. Many Iranian-Americans have founded, invested in, or reached the top ranks of some of the most prominent Silicon Valley companies. The close-knit community of Iranian-Americans and the high value of education in the Iranian culture and families is one of the reasons our community is getting more powerful day by day. Let’s take look at some of the most prominent founders, funders, and executives in tech of Iranian heritage. Dara Khosrowshahi: CEO of Uber. Ex-CEO of Expedia. Ali & Hadi Partovi: Ali co-founded LinkExchange and Hadi co-founded Tellme Networks. Both companies were acquired by Microsoft. The brothers are early investors in Facebook, Dropbox, AirBnB, Uber, Zappos, and many other startups. They then started Code.org, a non-profit organization which teaches computer science and coding to students. Amir Khosrowshahi: co-founder of Nervana (AI company) acq. by Intel for $400M. Bonus point: the 4 people above, as well as some other prominent entrepreneurs are all relatives. Check this Washington Post article. 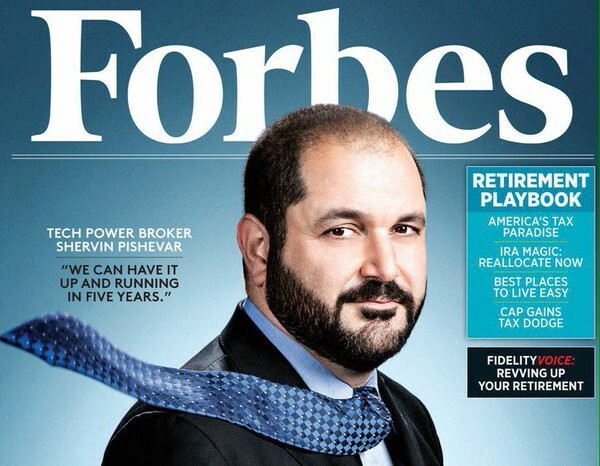 Shervin Pishevar: Co-founder/executive chairman of Hyperloop One and co-founder/managing director of Sherpa Capital. Previously he was a managing director at Menlo Ventures where he led investments in Uber, and Warby Parker. Before that he founded WebOS. Pierre Omidyar: Founder of eBay. Pejman Nozad: co-founder and managing director of Pear Ventures which has invested in Dropbox, LendingClub, Gusto, Guardant Health, Philz Coffee, DoorDash, etc. Previously he invested in PayPal as part of Amidzad Ventures. He has an amazing (someone should literally make a Hollywood movie!) life-story, read it here. Shaygan Kheradpir: CEO of Coriant. Previously CTO of Verizon, COO of Barclays Bank, CEO of Juniper Networks. Bobby Yazdani: co-founder and managing director of Cota Capital and Signatures Capital where he has invested in Google, Dropbox, Uber, Bonobos, Bina, Salesforce, etc. Previously he founded Saba Software and took it IPO. Saeed Amidi: Founder/CEO of Plug and Play Tech Center, one of the largest start-up incubators and super early stage investors in Silicon Valley. Sean Rad: Founder of Tinder! Ali Rowghani: CEO of YCombinator Continuity (YC’s $1B investment fund). Previously CFO of Pixar, and CFO then COO of Twitter. Kamran Elahian: Chairman and co-founder of Global Catalyst Partners, an international multi-stage Venture Capital. Previously founded Cirrus Logic (took to IPO) and many other semiconductor companies. Mohsen Moazami: Managing Director at Columbus Nova Technology Partners. Previously he was a VP at Cisco and before that, he founded Stanford Business Systems which was acquired by Kurt Salmon Associates. Shane Tedjarati: President/CEO of Honeywell’s High Growth Regions (Asia, Africa, Middle East, and Eastern Europe). Honeywell ranks 73 in the Fortune 100 list. Farhad Mohit: Serial entrepreneur, Founder/CEO at Flipagram, BizRate, Shopzilla where they were all acquired. Ali Vahabzadeh: Co-founder/CEO of Chariot acquired by Ford. Farzad Nazem: ex-CTO of Yahoo! Now he and his wife, Noosheen Hashemi, manage the Hand Foundation and various other non-profit organizations. Bijan Sabet: General Partner Spark Capital investor in Twitter and Tumblr. Shahin Hedayat: Founding partner at Candou Ventures. Founded Beceem and Enverv reaching IPO and acquisitions generating over $4B. Rouz Jazayeri: Partner at Kleiner Perkins Caufield and Byers. Shayan Zadeh & Alex Mehr: Founders of Zoosk, an online dating company with over $180M annual revenue. Babak Pahlavan & Nima Asgharbeygi: Founders of CleverSense Acquired by Google and now executives at Google. Amin Zoufonoun: VP Corporate Development Facebook. Previously Director of Corporate Development at Google. Max Gazor: General Partner at Charles River Ventures. Previously Corp. Development Manager at Cisco. Tony Shakib: GM for Microsoft’s IoT business. Previously VP at Cisco. Narges Baniasadi: Founder/CEO of Bina Technologies, a bioinformatics company, which was acquired by Roche. Now she serves as a VP at Roche. Keyvan Mohajer: Founder/CEO of SoundHound, a Natural Language Processing company with over $75 in investment. Armin Ebrahimi: Founder/CEO of ShoCard, a blockchain company. Previously CEO of Advertising.com, CEO BuySight and SVP Yahoo! Hessam Esfandyarpoor: Founder/CEO of Genapsys, a Genetics company, with over $45M in investment. AmirAli Talasaz: Co-Founder/President at Guardant Health which recently raised $550M in venture capital for cancer detection using blood tests. Nima Ghamsari: CEO at Blend, a mortgage lending technology platform, which has raised $160M in venture capital. The list of successful Iranian-Americans in Silicon Valley is definitely much larger than the above and I have for sure missed some prominent names in this list. Also, I have not included some very prominent scientists like Dr. Firouz Naderi, Dr. Nader Engheta, etc. in this list or successful entrepreneurs who don’t work in Silicon Valley like the world-renowned Anousheh Ansari. Falon Roz Fatemi: Founder/CEO of Node.io with $18M+ funding (Mark Cuban is an investor!). Previously youngest employee at Google. Reza Zadeh: Founder of Matroid, a computer vision company. Adjunct Professor at Stanford. Mahyar Salek & Mahdokht Masaeli: Founders of Deep Cell, a prenatal testing biotech company. Arad Rostampour: Founder/CEO of ZenHealth (YC backed) and co-founder of SocialShielf acquired by Avira. Saam Motamedi: Investor at Greylock Partners, previously founded Guru Labs. Yasmin Razavi: Investor at Spark Capital, previously at Index Ventures and McKinsey. Niki Pezeshki: Investor at Felicis Ventures backing iconic companies. Ali Kashani,: Founder of Lux.io (AI in food company) acquired by PostMates and now an executive at PostMates. Mehdi Samadi: Founder of Solvvy, an AI-based CRM company which was featured in WSJ, etc. and raised $4.5M. Ehsan Saeedi & Danial Ehyaie: Founders of Gate Labs, the smart lock company. Ben Nader: Founder/CEO Butterfleye, a security solutions company with $4M+ in funding. Sara Naseri: Founder of QuraSense (YCombinator backed). Previously founded BUCKY’o’’ZUN a sun protection technology. Babak Elmieh: Founder/CEO of Nascent Objects acquired by Facebook. Daniel Ahmadizadeh: A recent YCombinator backed company building a product for real estate agents which has raised over $3M in venture capital. Padideh Kamali-Zare and Kaveh Vejdani: founded Darmiyan, a YC-backed software platform to detect Alzheimer’s disease. Arman Jahangiri: Founder of ResultCare, a digital healthcare company. Robert Ravanshenas: Senior associate at Maven Ventures. Mahbod Moghadam: Founder of Everpedia, a next-gen encyclopedia. Previously founded Genius. and the youngest one to join the club, the 15 years old! Soroush Ghodsi: founder of Slik.ai (a lead generation company) who is the youngest founder ever to join Ycombinator! I am happy to call many of these people my friends and mentors. Please follow me here on medium and on Linkedin for more posts about tech, startups, Iran’s startup scene and entrepreneurs. Founder turned VC at DCVC. TEDx Speaker. Featured in BBC, Forbes, Guardian. Add me on LinkedIn.